Black fungus, or Auricularia polytricha, is sometimes known as wood ear, cloud ear, Judas ear or tree ear. It is a mushroom that is dark brown to black and native to Asia and some Pacific islands with humid climates, according to the Mycological Society of San Francisco. It is edible and often used in Asian cooking. It is a beneficial herb in helping with health issues by treating the lungs, stomach and liver, according to the Institute of Chinese Medicine. The Mycological Society of San Francisco states that black fungus has a chemical that inhibits blood clotting, and because heart attacks, strokes and blood vessel diseases are linked to clotting, this fungus may improve circulation. Veg for Life also states that it contains anticoagulant substances that act like blood thinners, similar to that of aspirin. Black fungus may lower cholesterol and blood sugar, according to the Sierra Club Pro website. Laboratory testing in mice found that this type of fungus had a hypoglycemic effect on obese mice. Serum LDL cholesterol levels were reduced by 24 percent in the mice tested. 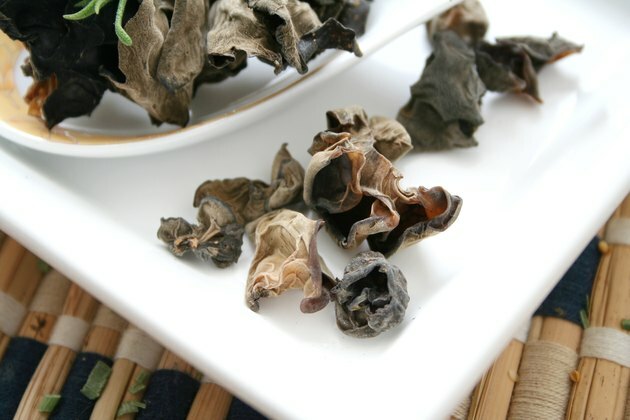 Due to the ability of black fungus to help with blood circulation, it is also useful in helping with hemorrhoids, according to Chinese Medicine Gem. It has a cooling effect on the blood, promoting circulation and treating bruises, which may be why it is used to treat hemorrhoids. Black fungus is beneficial to people suffering from dryness, such as a dry throat, cough or mouth, according to the Institute of Chinese Medicine. It is thought to moisten the blood and promote circulation, which alleviates conditions associated with dryness. According to Veg For Life, black fungus contains the trace mineral germanium, which has anti-viral and anti-tumor effects. Germanium is also known to energize the body, which is why it is useful as an herb that fights off viruses. In Chinese medicine, herbs such as black fungus are used to promote positive emotions and help with feelings of isolation, fear and insecurity, according to a Pacific College of Oriental Medicine article. Black fungus is thought to help people resist hunger, help with uterine bleeding, gonorrhea and intestinal issues, according to Chinese Medicine Gem.